Send individual or bulk text messages to your audience using our UK SMS gateway. Voodoo SMS is a powerful online platform that lets you deliver bulk SMS messages to prospects, app users, existing customers and other custom audiences. Our competitively priced UK SMS gateway lets you send and receive texts online. Use your existing long phone number or send your SMS messages from our short code number with a customised promo code for your campaign. Save money on each message you send with our competitive volume-based pricing. Whether you need to send a small text message broadcast or thousands of messages to UK numbers, Voodoo SMS is the reliable, affordable UK SMS service you've been looking for. Our SMS gateway is designed to be both powerful and user friendly, making it easy for you to set up and launch your SMS marketing campaign. To get started, all you need to do is create your account and import your audience. Our platform allows you to send text messages to your existing list of opt-in marketing prospects, customers, competition entrants, mobile app users and more. Once you've imported your list, it's time to write your first message. With Voodoo SMS, you can send your text messages out to your entire list as a broadcast, schedule them for delivery later or send them to recipients in small batches to produce a constant stream of responses. Our competitive bulk pricing means you can pay as little as 1.74p per message to send texts to UK phone numbers with Voodoo SMS. Our UK SMS service fully supports dynamic SMS, allowing you to customise your messages with a person's name, phone number and other information. Personalising your messages is one of the most effective ways to increase your SMS campaign's response rate. 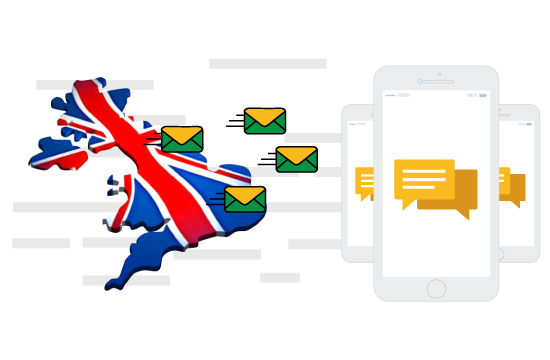 Whether you need to send one message or hundreds of thousands of messages, our platform has more than enough power to handle your UK bulk SMS campaign. We're trusted by top UK SMS marketing companies to successfully deliver high-volume text messaging campaigns. We're one of the top UK email to SMS gateway providers. Using our email to SMS service, you can deliver your text messages to UK phone numbers from your email account, even if you use a third party email service such as Gmail or email software like Outlook or Mail for Mac. The Voodoo SMS API makes it easy to integrate our UK SMS gateway with your application to send automated text messages to prospects, users and customers. With our API, you can even program Voodoo SMS to automatically send messages to contacts added to your CRM tool. Our highly affordable pricing means you'll pay less for each message the more you send. When you purchase SMS credits in bulk, you can pay as little as 1.74p per SMS to send your message to UK phone numbers. Voodoo SMS is one of the UK's most trusted SMS gateways. Create your free account and get in touch with your target audience, existing customers, mobile app users or any other opted-in SMS marketing list now.